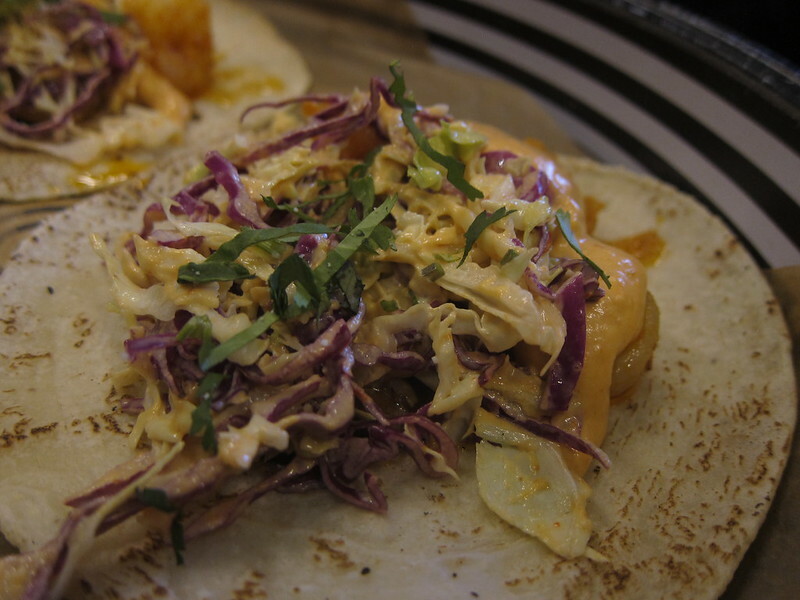 A recent first but not last visit to Cruz Blanca revealed that, in what should be a surprise to absolutely nobody, Rick Bayless knows how to make some damn good tacos. Also unsurprising: The combination of the cachet of the Bayless name, the ingredients he uses, and West Loop rents means these are expensive tacos ($4-$5 apiece). Moderately surprising but perhaps shouldn't be: Bayless and his brewmaster make some very good beer. Surprising: There were some service and execution issues. The meal actually started as a slightly mixed bag. Before ordering the tacos, we sipped on beverages and snacked on queso fundido and a tlayuda (a 14" tostada). 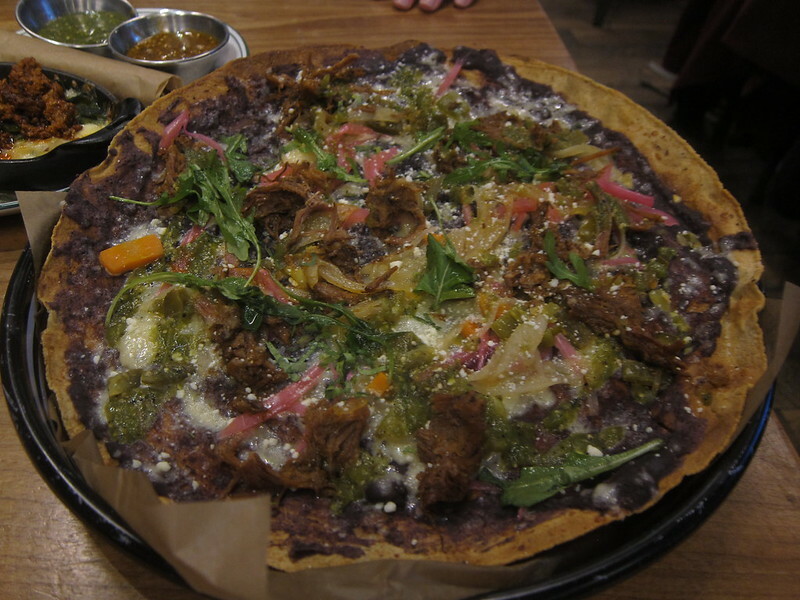 I liked both, though my dining companion thought the tlayuda was burned, and we both would have strongly a spicy chorizo in the queso fundido. Where there was no disagreement was our assessment of the tacos: Fillings were fantastic and generously supplied across the board, but the tortillas should have been warmer. 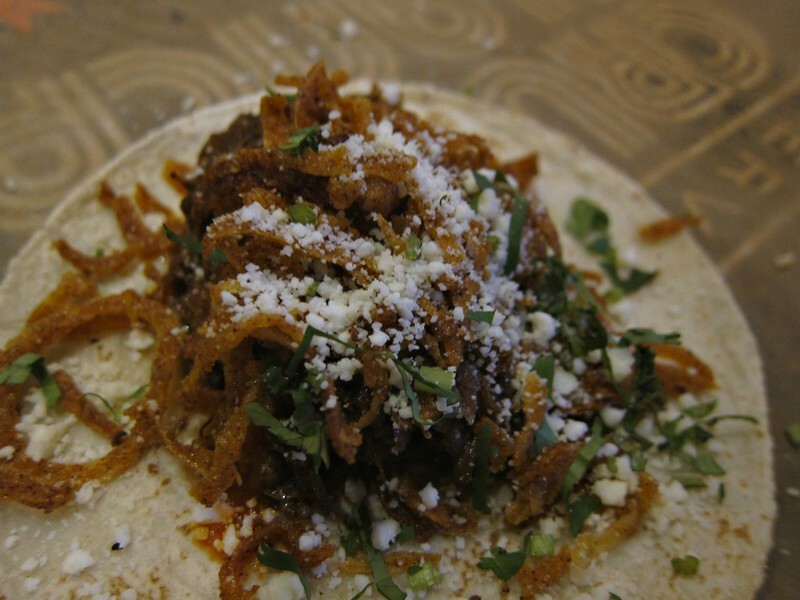 The crispy onions added a bit of flavor and, more importantly, some crunch to balance out the outstanding red chile braised short ribs. Looking at this picture is bringing back some mouth watering memories. 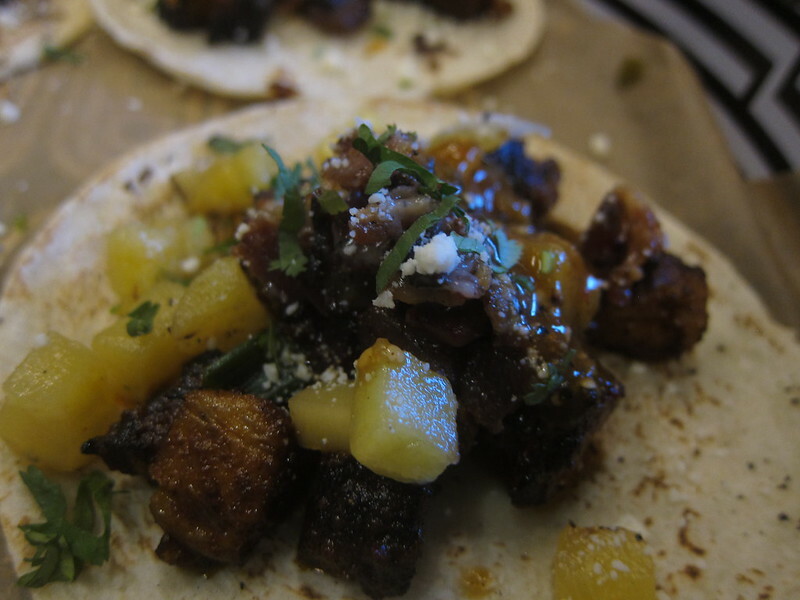 Marinated chunks of pork belly, perfectly crisped, and accompanied with grilled pineapple, knob onions, bacon, and queso fresco. Apologies for the picture quality and the angle on this one. It looks like the chipotle mayo and red cabbage slaw overwhelmed the chipotle mojo marinated shrimp but the little Florida pink shrimp (a slavery-free variety) certainly held up to the toppings. The vegetable heavy tacos were just as good as the meat-centric ones. The grilled cauliflower (not picture), which comes with poblano-onion rajas, crema, and queso anejo and cilantro, made two carnivores swoon. 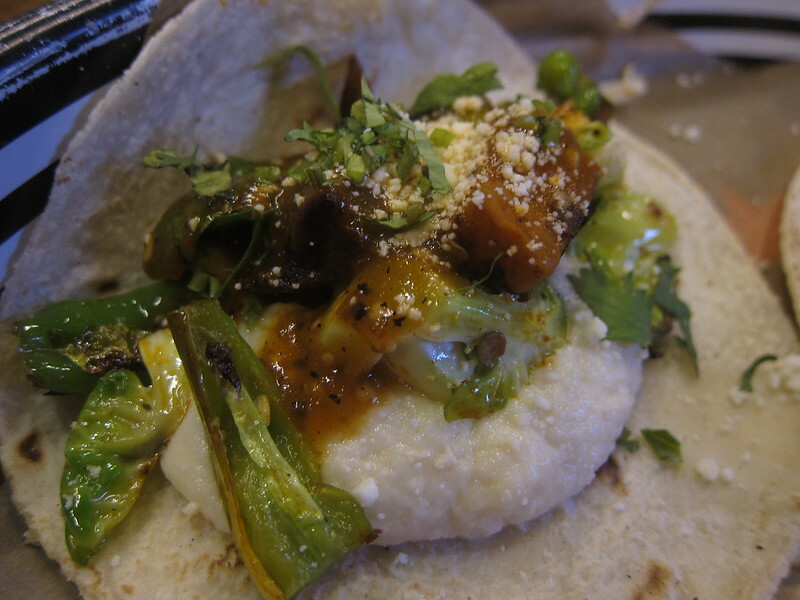 And the Brussels sprout and shishito taco, which came with butternut squash, bacon, and cauliflower mash was almost as good. I'm not sure if they were short-handed on our visit, but there were several extended periods of no interaction with a server. The restaurant was packed, but I assume that's a regular occurrence. The amount of time we waited for our orders to be taken (both initially and when we clearly had empty drink classes) and our orders to arrive (again, both food and replacement drink) wasn't up to par. I'm hoping it's an anomaly. All reviews of this place should include bonus points for the bottle of Valentina on each table, a quality nod to that simple salsa's greatness from a man who presumably made a fortune selling his own salsa company. Thanks for the report - I'm a Bayless fan and this is on my to-do list. MarlaCollins'Husband wrote: All reviews of this place should include bonus points for the bottle of Valentina on each table, a quality nod to that simple salsa's greatness from a man who presumably made a fortune selling his own salsa company. Great observation. I love Valentina, and I've always appreciated that Rick uses mostly non-Frontera products on his cooking shows.